RadPanelBarItem inherits from HeaderedItemsControl therefore it can display hierarchical data, e.g. collections that contain other collections. The HierarchicalDataTemplate class is designed to be used with HeaderedItemsControl types to display such data. There should be virtually no differences between the usage of HierarchicalDataTemplate in RadPanelBar and other controls. The following example demonstrates how to create a hierarchical data source and bind a RadPanelBar to it, using a HierarchicalDataTemplate. The ItemsSource property of the HierarchicalDataTemplate specifies the binding that has to be applied to the ItemsSource property of each item. The DataTemplate property specifies the template that has to be applied on each item, while the ItemTemplate is the template applied on its child items. Property Price which is of type double. 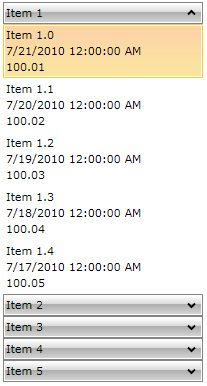 Property CreatedOn which is of type DateTime. Property Title which is of type string.